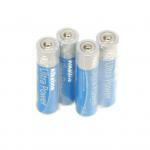 Pack of 5 x lithium CR1620 3 volt button cell. Often used in laser pointers, LCD handheld games, cooking timers, LED keyrings and what have you. Not always easy to find in regular shops, but here offered for a friendly price. Keep them in your refrigerator for longer shelf life.